Protein powder, used by bodybuilders, vegans and anyone looking to boost their protein intake, often comes in large tubs that can take some people one year or more to use. 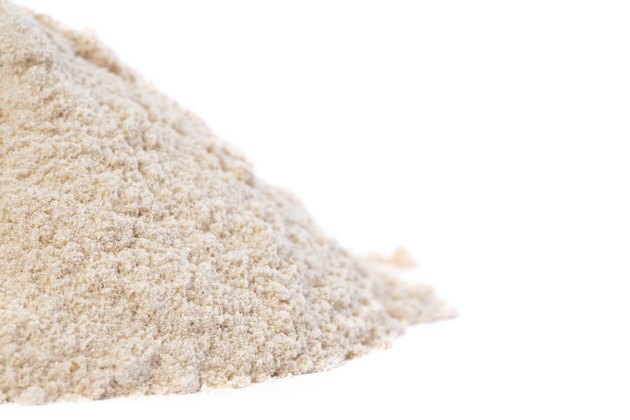 Protein powder is a dry food and has a fairly stable shelf life. Even so, you should take precautions to keep your protein powder fresh to retain its effectiveness and flavor. Store protein powder in a cool, dry, dark area. According to USA Emergency Supply, dried foods are best stored at cooler temperatures around 72 degrees Fahrenheit or lower. Store your protein powder in a cupboard away from a heat source, such as the stove, or keep it in the refrigerator. Reseal the container tightly after each use to avoid moisture from getting into the powder. USA Emergency Supply says it is especially important to keep moisture away from dried foods during storage. Guard against liquids or other substances entering the protein powder container when you open it for use. Other less shelf-stable contaminants may cause the formation of mold or bacteria. Check the expiration date on the container and dispose of any unused protein powder after the suggested date.